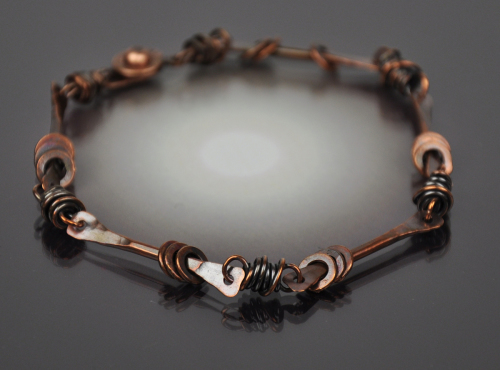 This handcrafted copper bangle is hammered and riveted, and looks great alone or layered in a set. These are hand stamped by me, thus any word is possible! Please measure the widest part of your hand, cupped with your thumb tucked in, as this is the widest part it will have to slide over. It is easiest to cut a string this size and then measure the string. 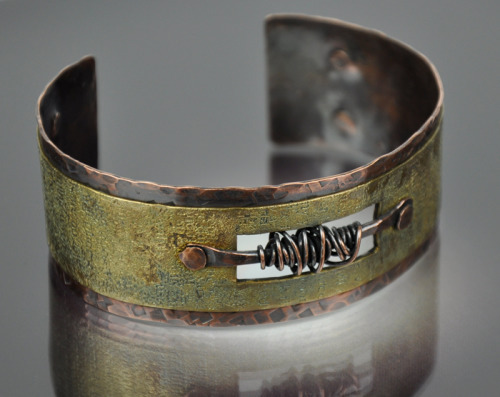 This open cuff is created with hand textured copper layered with etched brass. An open window adds depth with a hammered copper bar that is wound with copper. The width of the cuff is 1 3/8". A hand applied patina is then added to the entire piece for depth and an aged appearance. 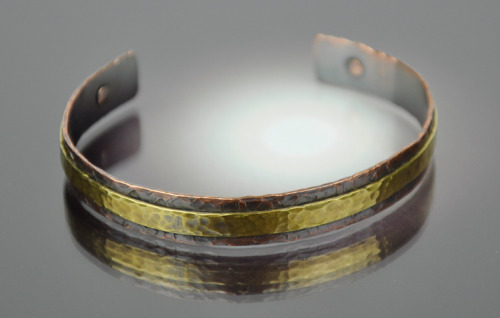 This simple cuff is a standout alone, or layered up with a grouping! A band of brass has been cold-connected to a copper base of approx. 3/8" wide. A hand applied patina has been added to the piece. 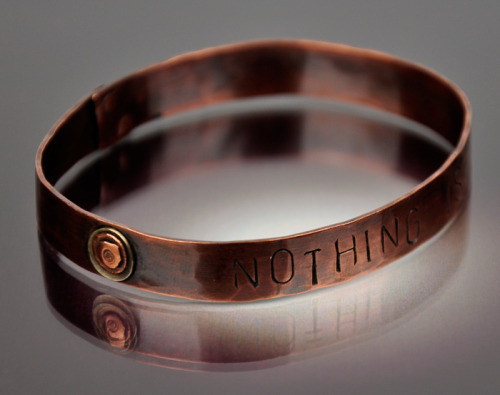 Copper bangle, available with multiple quotes and in sizes SM, MD & LG, is 1/2" wide, hand stamped, and cold connected. The oval shape fits perfectly on your wrist. Please specify SM, MD, or LG. 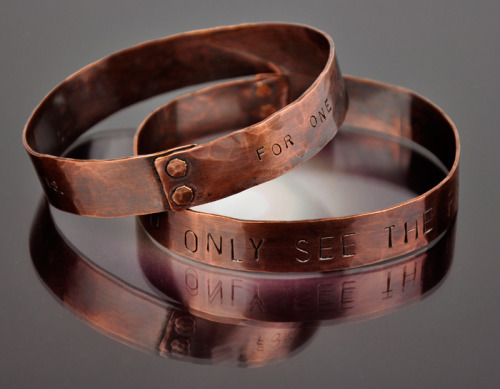 Copper bangle with a hand stamped quote, a sterling and copper decorative element, that is finished with a cold connection and has a hand applied patina, and is 3/8" wide. Please specify SM, MD, or LG. 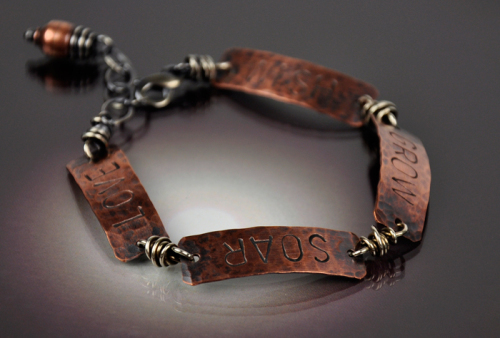 Copper pieces have been hand-stamped with the words ''WISH GROW LOVE SOAR'', hand wrapped with sterling silver, and finished with a sterling lobster and extender. 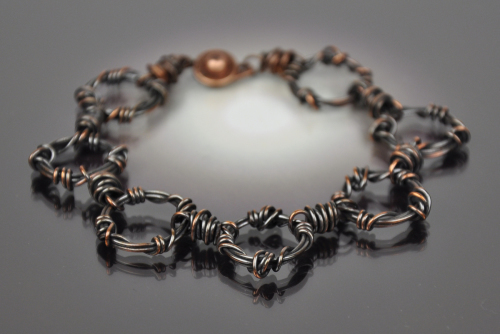 The actual sale piece has a sterling dangle, not the copper bead. This bracelet lays SO nice on the wrist! 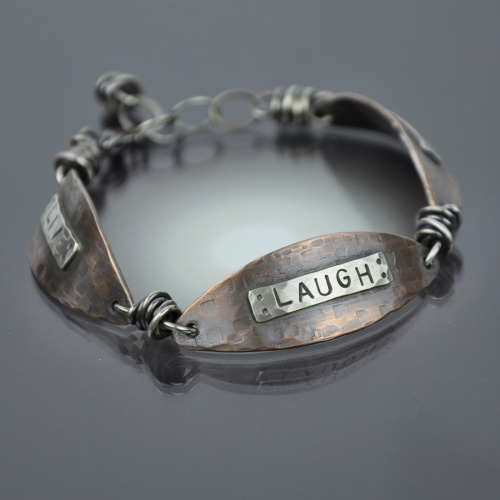 States LIVE LAUGH LOVE hand stamped in sterling silver and each is then soldered onto a curved copper oblong oval piece. 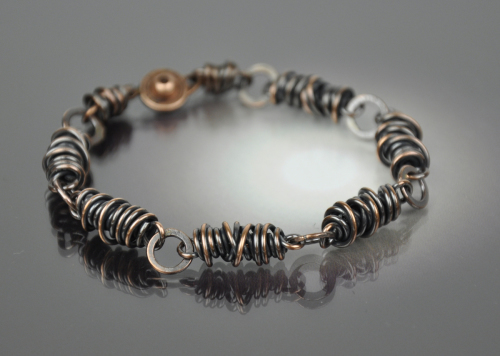 Hand wrapped with sterling, and is finished with a hand applied patina. Adjustable between 7"-8". Also available as HOPE FAITH LOVE. 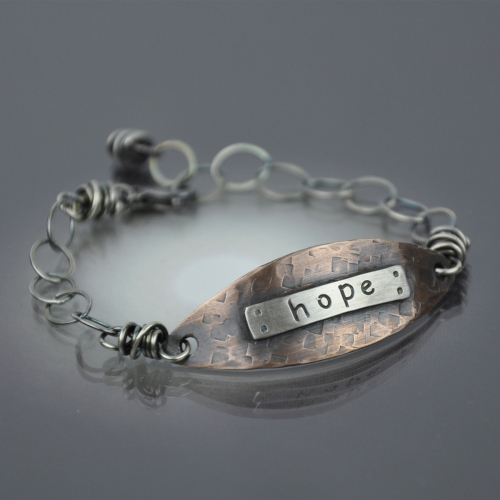 A sterling silver bar is hand stamped with "HOPE", then soldered onto an oblong copper oval. 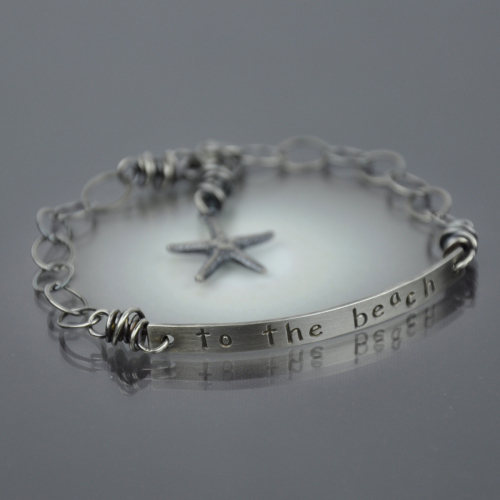 The chain is sterling, with a lobster and sterling dangle at the other end, and is adjustable to 7". 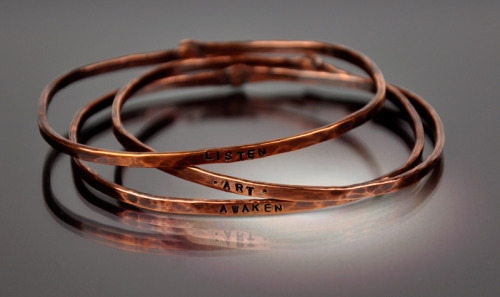 Hand formed copper sticks have 3 floating copper rings on each, and are hand wrapped together. All of my pieces are finished with a hand applied patina. Messy hand wrapped rings are connected with a hand wrapped link. All of my pieces are finished with a hand finished patina. 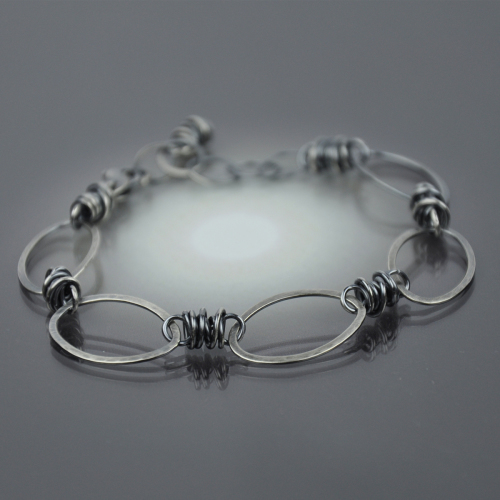 Messy hand wrapped links are connected with soldered rings, and finished with an easy to close push clasp. All of my pieces are finished with a hand applied patina. 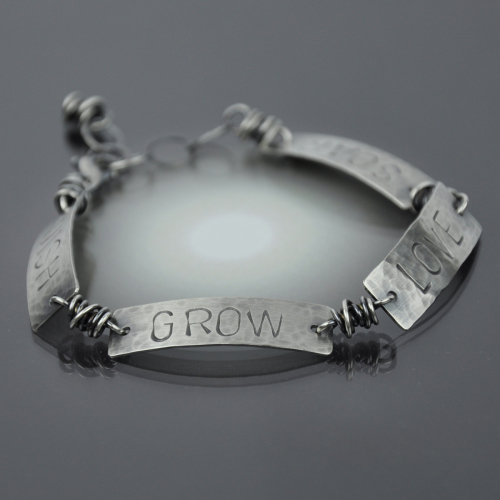 Sterling silver rectangular pieces have been hand-stamped with the words ''WISH GROW LOVE SOAR'', hand wrapped with sterling silver, and finished with a sterling lobster and extender. All of my pieces have a hand applied patina.